As previously reported, Basij forces clashed with Azad University students yesterday. This new video purports to show a Basiji exasperated by the students' disregard for his calls to leave the premises. He may be an employee of the university, but his black shirt seems to indicate he participated in the Basij ceremony held in the university's mosque to mark the martyrdom of the 6th Imam. A human rights group has released a Farsi version of a viral animation depicting the Universal Declaration of Human Rights. The Human Rights Action Center, headed by world-renowned activist Jack Healey, first posted its English version of the film in October of last year. It has been viewed over 750,000 times on the group's YouTube channel alone. The animation was created by Seth Brau, a Californian native and NYU Film School graduate, and produced by Amy Poncher. The music is by Rumspringa. 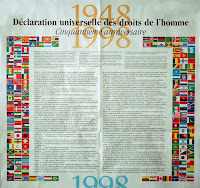 The Universal Declaration of Human Rights was adopted by the UN General Assembly on December 10, 1948. It is composed of a preamble and 30 articles.